If I put the skateboard on the ground, Boomer will take off with it! It’s true, he gets on the board and pushes himself with either one back leg, or runs with his two back legs to gather speed, then he hops on. Of course I don’t let him take the board alone because he doesn’t know how to steer the board, he’s too light. and frankly it took over 5 months to teach him to push and I don’t think it’s fair or worth it to teach him to also steer. Still, it’s amazing. So we turned his talent into a world record. 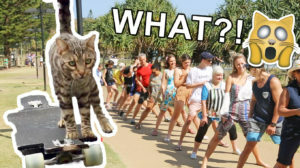 Longest Human Tunnel traveled through by a cat on a skateboard. Written by Didga · Filed Under Dog Training & Latest NEWS! Why the ‘pack leader’ mentality for training and living with your dog is outdated. In the dog-training world, there is “Old School” training and there is “New School” training. Both styles are effective because dogs are eager for attention, shelter and food – this is why they are so easy to persuade. However, it’s important to me how a dog feels in its home and when it’s being trained. Here are some things Old School trainers might do or believe as part of their training style. An Old School trainer will take a more dominant approach, having less patience while expecting more immediate results. Old School trainers want dogs to be submissive to them; they may use praise but use more correction or redirection techniques without reward. Old School trainers are fond of using the “pack leader” analogy to describe the relationship between owner and dog. In the wolf society the pack leader is the one sitting alone (most of the time). When he walks around, he’s got to play the part by acting like the tough guy. Other members of the pack will lick his face and keep their tails tucked under, and ears back. This signals to the pack leader that they are not a threat and that they are not going to challenge him for mating rights. Which is what the pack leader’s role is – MATING! This doesn’t sound like the relationship between human and dog. On the other hand, New School trainers and their techniques focus on what a dog is doing right – rather than wrong. New School trainers use motivation and redirection techniques, incorporating food, toys, clickers, praise and patience. New School trainers don’t relate anything a dog does as an act of dominance or positioning themselves as a pack leader or follower. Instead, they understand that much of a dog’s behavior is a product of their specific breed traits, or how much or how little early socialization and education has occurred. And don’t forget about an owners lack of knowledge, this can play a large part of their dogs behaviour. New School trainers want a dog’s state of mind to be confident, not submissive. They understand that dogs don’t need to be submissive to listen. They also understand that dogs like to work as a team, to succeed, which is why dogs need a teacher and not a pack leader. 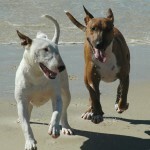 Education and practice helps build good communication skills with your dog. With practice, patience and proper teachings, a dog can learn to behave appropriately for any situation that comes its way. Preaching the Old School style of training only helps to perpetuate the dumbing down of dogs and dog owners. When we think the old school way we become lazy and our expectations become too high. I say give the dog a break. Educate – be its teacher, not its pack leader. For many, many years now, after taking a lesson with a client on how to teach their dog not to pull on the leash, I would send them a link to a private “Stop Leash Pulling” tutorial. That way, they had unlimited access to a tutorial that helps remind them of everything we covered during the lesson. Well, I am now making these tutorials public, well, as long as the ‘public’ likes them. I’ve added a lot more to them since they’re not just for reminding someone of what to do, but explaining the whole process step by step. FYI- Generally there is very little compensation putting these tutorials out in the public domain, unless of course I get in the hundreds of thousands of views….so if you like my videos, click like and subscribe to my YouTube channel so that I can keep providing this useful info to all you animal lovers for free! Here is the first video to be released: LEASH TRAINING A PUPPY This is a training exercise for young puppies BUT can be applied to dogs of all ages, especially sensitive dogs. Here is STOP LEASH PULLING #1 for dogs older than 4 months of age. When I first started training over 30-years ago, the majority of trainers and animal professionals prescribed that dogs be at least 6- months to 1- year old before starting a basic obedience class. I was advocating 4-6 months, still WAY off from what is being recommended today. Animal professionals now all agree (the good ones anyway), that seeking help from an animal professional needs to start before even getting a dog, or right when you bring your new dog home (at the latest). Well, that’s if you want to avoid many of the frustrating and costly problems from happening, ESPECIALLY the big one of having to surrender your dog to an animal shelter where chances of survival are slim. This is not to say older puppies and dogs can’t learn or change to be wonderful pets, this is what we trainers do everyday, and with today’s scientificly proven techniques, along with years of experience, miracles (I use that word loosely) are being performed. Changing some behaviors can take several training sessions and many weeks to get it right, the cost can be intimidating to some, and some people may not have the time to make that happen. A trainer understands that many, if not all, the bad behaviors would have never developed if the dog and owner had PROPER early education. Teaching someone how to prevent behavior problems from developing is SO much easier, for dog and owner, and the cost would be lower too. For the 95% of you who will call a trainer when you’re at wits end, still call, it’s never too late, just know for next time, Proper Prior Planning Prevents Piss Poor Performing Puppies… and adult dogs. I’ve posted several blogs regarding prevention… Happy browsing. In the dog training world, “Opposition Reflex” is a term used to describe why a puppy first resists the tension of the leash by stopping or pulling away. When tension is applied, a dog’s predatory instinct of fight, freeze or flight kicks in. Many people don’t realize dogs have this reflex or they believe a dog stops or pulls out of spite or challenge. It was discovered by Ivan Pavlov (1849-1936) and is discussed in many books since, including a 1996 book by Jean Donaldson, “The Culture Clash”AMAZON BOOKS . To see opposition reflex in action, just put a leash on your cat. That’s opposition reflex! The more “wild” an animal is, or the more predators an it has, the stronger the reflex will be. Thankfully, dog’s have been domesticated and puppies are fast learners. Through conditioning, patience and trust, this reflex diminishes. People make the mistake initially when getting a new puppy by placing it on the ground and following it around. Once the puppy can tolerate the collar and leash, the owner then allows the puppy to pull in the direction they want. As the puppy grows and gains more pulling strength, most owners make the mistake of putting these harnesses (that you see on sled dogs), along with a tightly held leash or retractable leash, allowing opposition reflex and the pulling behavior to really kick into gear. Opposition reflex plays a role initially and throughout their lives, but there are other reason dogs continue to pull on lead. 1) The owner has conditioned them to lead the way 2) They’re being rewarded for pulling 3) Dogs have been conditioned to believe that the harder they pull, the more distance, smells and exercise they get, even if it means choking themselves in the process, and 4) The owners never taught them, in a language they understand, how to walk on a loose leash. Leash pulling can be counter-conditioned at any age by hiring your local reward / science-based dog trainer. The earlier you get started, the better. Feel free to comment below, If you subscribe with just your email, you will be notified when I post new things. After my studio animal training experience from 1987 1990 I opened my own business in the Los Angeles area. I called other dog training companies to find out what they charged for their services, as I really didn’t know. “What?” “That much?” That’s like $100 per hour! That was too much for me to charge, so I started out at US$50.00 for a 1 to 2- hour private lesson, then a few months later I charged$75.00. One year later $100 then $125, $150 and about 10 years into it I was $175-$200 – about what other “Good” trainers charged. The only low cost training program owners could find, are group classes. Six to twelve people pay anywhere between $30 and $150 for 6-8 weeks of classes (meeting once a week). That may sound like a good deal but for beginner dogs or owners, well- you get what you pay for > It’s under their paws. If you want a better-trained dog or you liked the other convenient options: training at your home, around the dogs environment, on your schedule, then one-on-one (private training) is a better choice. Those classes are still designed to teach the owner how to teach their dog, but at least the owner and dog will retain much more information, especially with follow up calls from the trainer. Established trainers charge up to $125 per lesson (approx. hour). Another training option is a board-training program that can run between $550 and $1200 per week. Most places will recommend 2 to 4-weeks of training, the cost can really add up. Even though the trainer does most of the time-consuming work, you still need to learn how to maintain the training. You definitely want to ensure the training company is legitimate and has a good track record. Referrals from friends or veterinarians for this type of program is necessary. You don’t want to find a trainer in a phone book or from hearing a radio ad. The cost for a dog trainer can seem high if you’re basing it on an hourly rate, however I believe you would have paid a lot more than $100 an hour at the moment you found the pile of poop on your new carpet, or you were late for work because your dog ran away, isn’t listening to you, keeps embarrassing you by jumping on people, barking during the night or day, chewing up your new shoes, etc. What you’re really paying for is years of acquired knowledge and experience. This information will save you lot’s of time, money and frustration. Helping your dog be a smart and confident member of the family, and not just a pet that’s a nuisance. Is hiring a dog trainer expensive? Maybe, but that doesn’t mean it’s not worth every penny. Just so other trainers don’t attack me, people and dogs can learn things in group classes. For beginner dogs or owners, I suggest having some private training first, getting some control of your dog before enrolling in group classes. If you and your puppy go through a Puppy Kindy course, they will need more education through the other stages their first year. Although training can be done anytime, 2 to 4 weeks of condensed training should be done around 4 and 6 months of age and repeated again when they are around a year old. Does your dog really know his/her name? or is it just another sound that comes out of you? Their name should have a specific meaning when they hear it. The tone in which their name is spoken is also important, even more so, because they learn the different tones and meaning for each one. Be consistent when using your tone and their name only when you need them to complete a specific task. Use a nickname for all other times. Nicknames are pet names-different than their real name, e.g. smooches, boober, treasure, little angel, puppy, my precious etc. 1. You have more than one dog and you need to specify which one you’re speaking to. 2. Your dog is distracted; Use their name before giving other commands. 3. You want your dog to follow you or stop running and/or return to you. It’s not just the dog’s name that people over-use, it’s many other words dogs become desensitized from. To help your dog understand what you’re saying, always follow up… Call your local -dog friendly- trainer to find out how. The better your dog is trained or well socialized, the easier it will be to take them with you on walks and in your car for day or overnight trips. It’s a win-win situation, your dog now benefits because they don’t have to stay home alone and they can be with you more and you benefit because they don’t have to stay home alone and they can be with you more. Every time your dog goes with you and gets exposed to strange noises, strange objects, other dogs, adults and children, the better behaved they can and will become, especially since you’re there to teach them. If your dog is not trained, un-socialized or doesn’t listen to you, you’re not going to hassle taking them with you, especially in the car. Untrained dogs usually bark at things as you drive down the road; they jump around inside the car; they won’t be quiet or calm down when you ask; you have to put on this complicated harness and extra thick leash to walk them; when you open up the car door they will charge out and almost pull your arm out of the socket; when on-leash they pull you and lunge at dogs or people. If a dog displays just one of those bad behaviors, it’s a reason enough to just leave them at home. The downside to this is they won’t get the practice they need to be better dogs. It’s a loose-loose for the dog. Taking your dog with you should be hassle free and fun! It can also be a social experience for both dog and dog owner. There are many establishments that allow dogs and if not, there’s NOTHING wrong with them waiting in the car. Most dogs love the car and are actually more comfortable and feel more secure in a car, than being home alone (Not on hot days) A well-adjusted dog just sleeps in the car while you’re gone. When you come out of your yoga class and on the 15 minute drive back home you take your dog to the park or have them sit with you at a coffee shop, or stop by a store and walk them around and practice your training. A trained or well socialized dog will spend 45% more time with the owner, than people with untrained or unsocialized dogs. That’s Totally Awesome from your dogs point of view! OK, I made that % number up, because I don’t think there has been any study. What I do know is a trained dog is allowed to be inside the house instead of outside, Goes on hassle free walks, more then leash pullers and goes on day trips or even overnight trips. My dog Schultz (mini-Schnauzer) accompanied me in the car 95% of the time. Even stayed with me in hotels with a no pet policy. I trained him to jump in my extra overnight bag and because he was well behaved, no one ever suspected a thing. He was truly living a human life in a dog suit. When people would make comments, and they did. “OH! Your dog is in the car? that’s mean”, I just tell them “Yes, and my dog is lucky, he spends 45% more time with me than your dog spends with you”. If you in another Country other than U.S. I’m curious what your list would look like. Pet shops, Lowes, Home Depot, Radio shack, some sporting good stores, some banks, just a few movie theaters (early shows only), some bowling alleys and many outside cafe’s. Learning from an Old Dog? The only thing an older dog directly teaches a younger dog are a few basic ground rules, like playing on their terms, not stealing toys, food, or sleeping spot (resource guarding). Older dogs understand the importance of first establishing good communication, teaching a younger dog to read their body language. Even a snarl, growl or snap is a normal form of communication. This is why many older dogs will first ignore a young puppy from a few minutes to a few weeks to establish these rules. Of course dog owners do the complete opposite, we spend the first few weeks giving our puppies anything they want. Younger dogs can indirectly learn some good things from an older dog, a few examples would be-when they follow an older dog onto the grass and around in circles, this triggers the younger dogs need to eliminate. If the older dog is trained to “come”, the younger dog by following the older dog may indirectly learn to come, to the older dog’s name. Most of the time it’s the bad behaviors not the good ones an older dog influence. Like when an older dog is digging, chewing (or other behaviors) the younger dog might join in. These behaviors are natural dog behaviors, but not every dog displays them, and young dogs can be influenced at an early age. The older dog can also influence where the digging is done or what is being chewed. How well your older dogs behaves has an effect on which good and bad behaviors they can influence, not directly teach. The second dog gets the least amount of “proper training” from the older dog and the second dog needs training the most. Don’t rely on your older dog to do anything, in this case you are the older dog, uh, I mean teacher, they need to learn from you. Because your dogs are too distracted by each other to learn new things, and the younger dog is more focused on the older dog than on you, they need first to be trained separately before they can learn together, It’s also advisable to separate them from time to time by taking just the younger dog on walks or car rides. If possible have your older dog spend a few weeks at a trusted friend or relative. For faster results practice shorter training sessions using the 1-minute training session. If you have any comments on this blog, feel free to leave them below. Puppies can learn from the moment they arrive home. In the States, the number one behavioral issue I had to deal with was Housebreaking. Over here, not everyone wants the dog in the house, I have my work cut out, getting these dogs to live inside. For dogs that live inside- housebreaking is the number one thing you should focus on. If you follow the right housebreaking formula, you will have minimal accidents in the home, however, it will still take a few weeks for a young puppy to grasp this formula and gain the muscle control needed to be 100% housebroken. The speed at which it takes, depends on many things, the breed, age of puppy, the time you can devote, what you’re expecting of them, how large the home is, and many other factors. With my experience, I can help you properly housebreak them faster, and with less ware and tear on the puppy. I’ve had many clients tell me about the almost perfect results they got after just one lesson. Before 4 months of age: We can teach a young puppy many things and without the use of correction type collars or correction training methods. We use conditioning and shaping techniques to teach them, so they can be part of our lives and not sitting in the backyard all day. Providing early education is essential for better, future control. There are some ways that dogs teach each other, that we can duplicate in a nonabrasive way. This helps your puppy learn more in a language they understand. Between 4 and 6 month: This is the perfect time to start a consistant, condensed round of training, 2 to 3 times a day for 3 to 4 weeks. Sound like a lot?. What if I told you- it works out to just 5 minutes a day. That’s right, I’ve been teaching people, how to teach their dog using a 1-2 minute- per session, training technique. And you’ll not only be able to teach them what to do, and when to do it, but also teach them what not to do. At this age they’re able to retain information longer, your puppy is like a sponge and very eager to learn, you’ll want to take advantage of this, because once they’re between 6 and 11 months, your listening little puppy isn’t going to be listening to you much anymore. Leash training is very important during this time, so a proper collar and leash is needed, a choke chain, head halter (type) are not appropriate with todays techniques. You’ll want to continue exposing them to different situations, dogs and people. Between 6 months and a year: At this stage your dog is going through mental changes; training during this time will be a little more challenging. Your cute little puppy is now paying more attention to the things around them and not you. Why?. Other dogs, people, smells, sounds have more meaning to them, so they are easily distracted. More patience is needed during this time and lots of technique. Around a year old: Your puppy is now a young adult and is somewhat out of the teenage stage. Another round of consistent training is highly recommended. Sit, Stay, Down and Come should all be advanced by now. 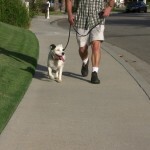 Your dog should be 100% trustworthy off leash and listen to you around many different distractions. A year and beyond: Even though your dog may know some basic commands, this doesn’t mean you’re out of the woods. Think of it as a person who just learns a foreign language, if they don’t practice they will loose some of it. Dogs can learn at any age, so just keep teaching and practicing. If you’ve done all the proper socializing, your dog listens to you in all situations, they have zero behavioral issues, you can now stray from the rules. Use the comment form below if you have any questions. Have you ever noticed that some dogs are just well behaved; they just seem to respond to what their owners want them to do? You watch T.V. and see trainers doing amazing things with dogs, but when you try to do the exact same thing, you have little or no success. As a professional trainer, I know I can make it look easy, Heck, I have 30 years of practice, It also helps that I have a clean slate with the dogs, they learn very quickly that I’m very clear and consistent of what I want or don’t want, and more important is how to get the things they want. Dogs are always asking; Did I do the right thing? Is this how I’m supposed to behave? ok, I know they don’t think in English, but if they could, this is what I believe them to be asking. As the trainer; I think as if I’m their teacher, I answer their questions-not through dominance (anyone can do that), but through patience, technique and practice. Dogs love to learn, explore and achieve success, dogs need something to do that satisfies their innate behaviors and breed traits. You have control of those things they desire, social bonding (Attention & shelter) prey (food), prey drive ( hunting, physical and mental exercise) Play fighting for hunting or fighting (Toys and games) If you want a dog to listen and take you serious, here are some tips to help you “Think like a trainer”. Tip #2 Dogs need to “Learn to earn”. Dog are always being rewarded for their actions anyway, why not reward them for listening, instead of rewarding them for just standing there looking at you, jumping on you, getting all excited and plowing into your leg? You have something a dog wants and needs: treats, toys, praise, exercise etc. You need to teach a dog to “earn it” in order to get it. Have them use their brain to offer you behaviors that get them what they want. i.e. sit, stay, walk,fetch a ball or come on command etc. Tip #3. Never ask a dog to do something unless you’re going to back it up. If a dog doesn’t listen, you need to follow through, if a dog listens, you need to follow through. If you don’t follow through, a dog will start to ignore you! Tip #4 Teach Basic Obedience commands. People don’t give this one the credit it deserves. As humans we start out learning the basics, from there we can achieve greatness. Dogs need to understand at least 5 basic commands and 3 advanced ones (shaking paws doesn’t count as one). Don’t be so impressed that your dog sits at a curb, thats really setting the bar low. I’m also not talking about the dog in the kitchen with you holding a treat in front of their nose, luring them into position. I’m talking about control from a distance, around distractions with or without treats. If done correctly obedience training not only teaches them what to do, but also teaches them what not to do. Tip #5 Don’t use one word that has different meanings. If you want your dog to get off you, don’t say “Down!”, say “off!” if you want your dog to sit, don’t say “Sit Down”, say “sit!” if you want your dog to jump off of the couch, don’t say “Get Down” because they will be very confused if you then want them to “Lay Down”. At first your dog will not learn the position that you are rewarding them for, they’re learning how they got there, so try to think of using a word or words per body movement. Tip # 7 Actions have consequences: Dogs learn by trial and error. When conditioning them, we can help speed things along by giving rewards for behaviors we like and using redirection techniques, or “soft corrections” for behaviors we don’t like. Using only positive consequences doesnt work, I’ve been there done that. Although it can work if you have lots of time, training talent, a border collie (or other smart dogs) or a bait bag glued to your hip, a young puppy or a dog with no bad habits. We wouldn’t have to teach them that their actions also have negative consequences. Like when a child does something wrong and is given a “time-out”, they to learn by trial and error. Yes, dogs are that smart. It’s not a correction using pain but mostly startling them- using touch, sound, smell, even time-outs. The goal is to mark the moment of their actions, both good and bad, so they realize their actions have consequences. Tip # 8 Hand, body and facial cues are what your dog learns first – before learning the tone of the word or words, then finally learning the word. Only after all that, the words can be said in a different tone, then they can be said with or without any body cues. Think of a deaf person who has specific cue to correspond with a specific meaning. Use specific body gestures when teaching and using in real life examples. People are increasingly busy these days and don’t have the time to train their dog. What people don’t know is teaching a dog doesn’t take up a lot of time and it can easily be incorporated into the time you spend with them. For years I’ve recommended to my clients to do between 1-2 minute training sessions. When I trained animal actors, sometimes the director wanted the dog to do things they weren’t trained to do. I would have very little time or only a few days to teach the new complex behaviors. I found that sessions kept under 2 minutes and doing 3-5 sessions per day is better than the 15 to 20 minute twice a day sessions prescribed by many trainers. On a weekly basis I will be posting training tips and “how to” videos that will teach you the techniques that I use and recommend. Malibu Dog Training is the home of the 1 minute training session. There is no magic pill , but the whole training prescription just got a little easier to swallow. Group classes are not designed to teach beginner dog anything, except maybe a few dog social skills before or after class. They are designed to teach the owner, then the owner goes home to teach the dog what he or she learned in class. The owner is distracted enough to learn the information, it’s worst for the dog. A dog should learn around little or no distraction, before practicing what they’ve learned around bigger distractions. Another reason owners have trouble teaching dogs is they try to teach them at the wrong time, usually when the dog starts misbehaving. This is not the time to teach, the trick is to recreate, or anticipate a situation, so you can fully walk the dog through the steps of how you want them to behave when that situation comes up in the future. other associations to grass, like playing and going to the bathroom. should know it was just “what’s around the corner”. friendly- instructor to find out how. Be patient, It takes time and practice for dogs to learn and listen in all environment, surfaces and situations.